Here’s a cupcake concept that is dependent on what fun, seasonal decorations you can find. This surprisingly detailed, wrapped chocolate rabbit was found in the bulk bin Easter area of a grocery store (Winco). A brown bunny could be Peter Rabbit. The carrots are from Kake Kreations, but could be made at home. What You Need: 1 cupcake; chocolate frosting (looks like garden dirt! You could also add crushed oreos); carrots made from icing. How to Make It: Frost cupcake, position sitting rabbit on top, and add carrots — some on the ground, some “planted” in it. 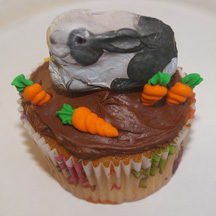 This entry was posted on Friday, April 8th, 2011 at 10:01 am	and is filed under animal cupcakes, Easter cupcakes. You can follow any responses to this entry through the RSS 2.0 feed. Responses are currently closed, but you can trackback from your own site.